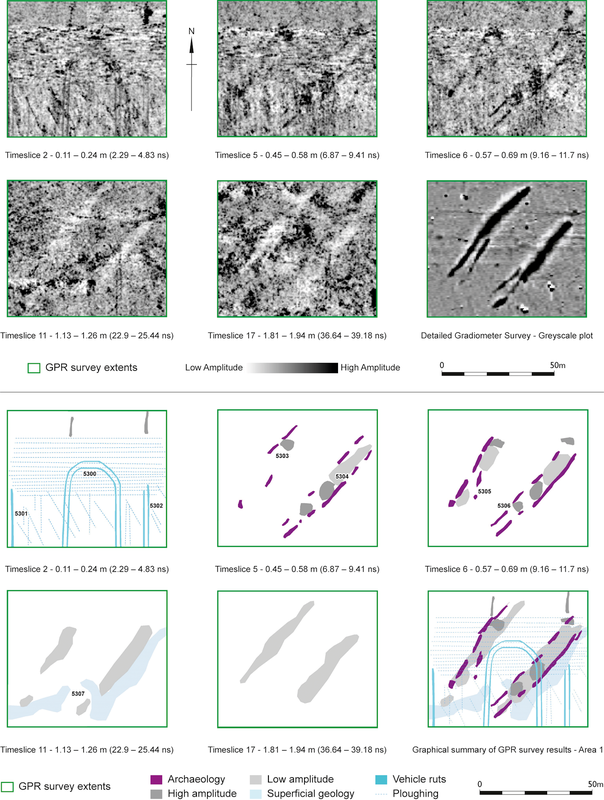 Geophysical results from the Historic England survey identified a range of features across the field, including a substantial ditch (Linford et al. 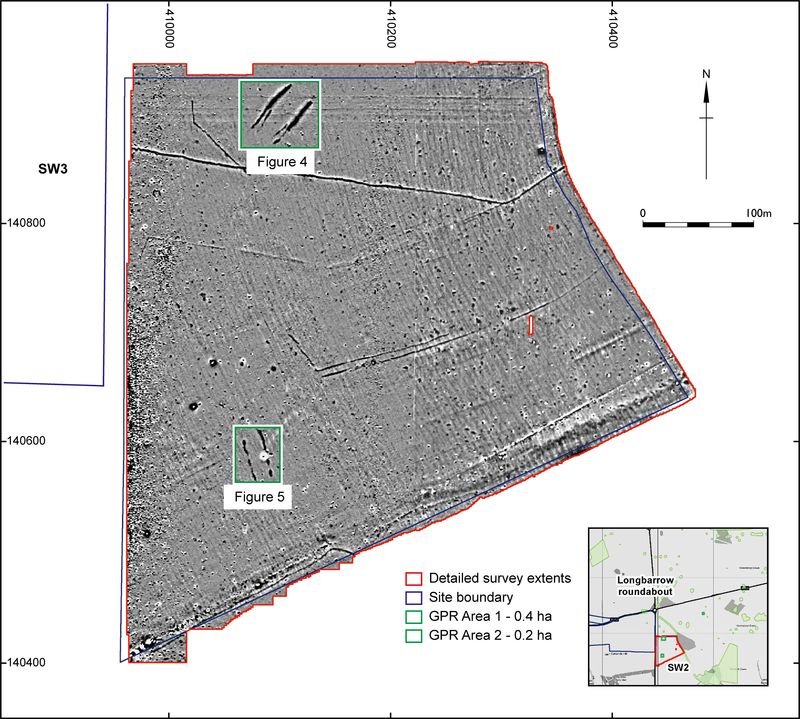 2015) on the same alignment as crop marks recorded from aerial photography, which comprised two sets of narrow lines orientated between NNE–SSW and NE–SW, approximately 75m long and 25m apart. There had been previous suggestions that there was a long barrow at this location, labelled Winterbourne Stoke 71 (WS71) when it was originally recorded (RCHME 1979), although its authenticity had been questioned in recent work owing to the morphology of the crop marks (Bowden et al. 2015). 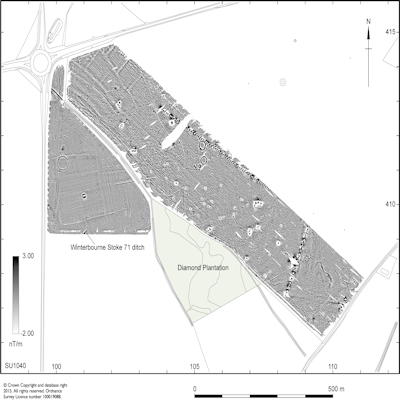 The field surveyed only included the northern tip of the western ditch (Linford et al. 2015). Full results and technical details have been published by Linford et al. (2015), and Appendix 6 summarises the methodologies used for both the Historic England and Wessex Archaeology surveys. 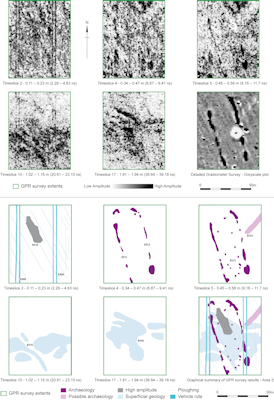 Later geophysical survey by Wessex Archaeology covered the remainder of the barrow (Wessex Archaeology 2016b). 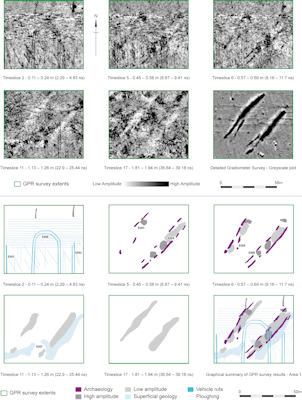 A combination of magnetometer survey (Figure 3) and ground penetrating radar survey (Figure 4) showed that the main ditches of the long barrow are well defined at the north-east end of the monument, but become progressively narrower as they head south-west. 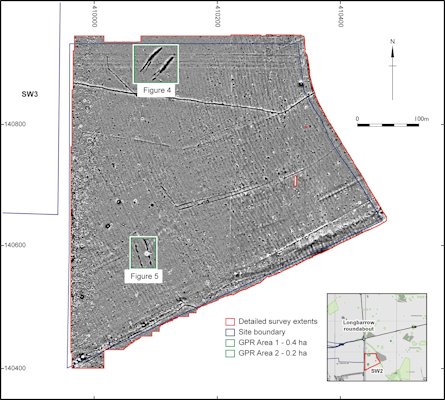 The southern half of the eastern ditch may be either segmented or contain significant dumps of chalk fills at certain points giving it a segmented appearance in the geophysical survey results, unlike on aerial mapping. Two slighter ditches, which may also be segmented, were apparent between and parallel to the main ditches at the south-western end, something previously hinted at on aerial mapping. A small number of what may be internal features were revealed between the ditches (Figure 4), possibly up to three pits in no particular arrangement and not necessarily associated with the barrow. Several small anomalies could also be seen beyond the ditches, but it is uncertain if these relate to the barrow. The barrow is overall rather shorter than was recorded from aerial photography, being only 54m long, and 20–24m wide (being wider at the north-east end), with the main ditches 1.5–3.5m wide. The internal ditches at the south-west end are both around 18.5m long. The Wessex Archaeology magnetometer survey also identified a second long barrow, previously unknown, to the south-west of WS71 barrow (now identified as HOUID 1611942/Winterbourne Stoke 86 (WS86); Figure 3). A new 'parish number' has been assigned to this barrow for ease of reference. All available sources were checked prior to the assignment of this number, and this new parish number has been included on AMIE and HER records for HOUID 1611942. 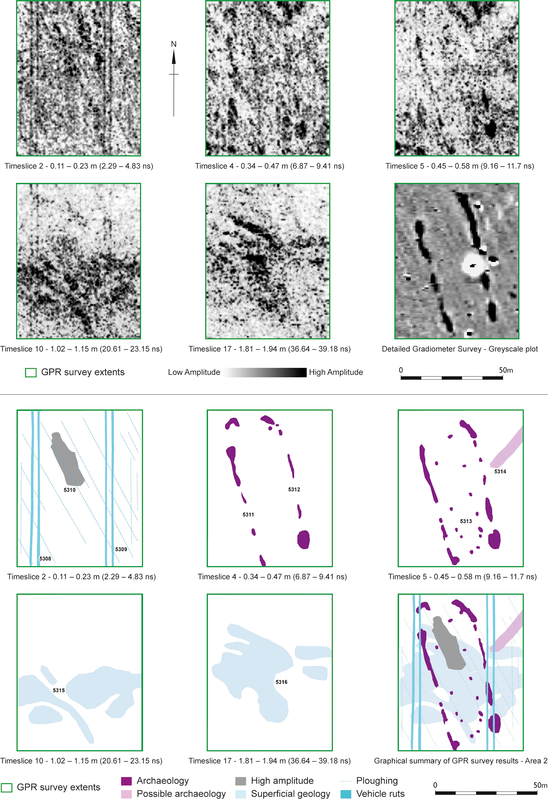 This barrow was also surveyed with GPR (Figure 5), and is on a north-south alignment, with ditches 40–45m long and 2–3m wide, separated by 12–14.5m. The ditches appear slightly segmented, suggesting that they have been truncated by ploughing, and turn inwards at the northern end (Wessex Archaeology 2016b). There are clear internal features, comprising an oval arrangement of eleven pit- or posthole-like features set a few metres in from the inner ditch edges. In the northern half of the barrow is a large high-amplitude anomaly enclosed by the internal features.